There are those rare moments when your inner child finds its grip on that over-abundance of imagination and wonder that we all possessed at one point in our lives and takes us back to that place where cynicism was a foreign concept. The Star Wars Rebels season 2 finale accomplished this difficult task brilliantly, by delivering its best episode to date. 'Twilight of the Apprentice' is the perfect example of just how talented Dave Filoni and his team over at Lucasfilm are. There is so much going on here for both adults and children to fall head over heels for. To say the least, a second viewing is a must. To get right to it, Rebels begins this epic journey with Ezra, Kanan, and Ahsoka hunting down the Inquisitors. For the first time, our rebel heroes are attempting to bring the fight to the Empire. While Ahsoka tries to translate an ancient relic written in the "old tongue," Ezra's impetuousness gets the better of him as he places his hand on the Sith device, which sends them falling towards the temple below. 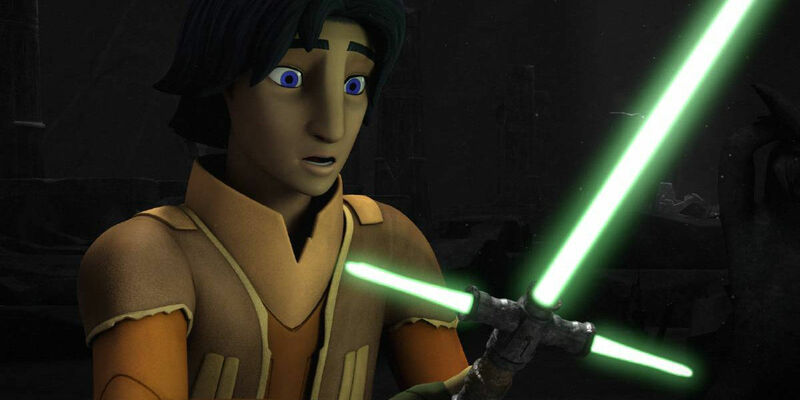 What's interesting here is Ezra's ability to connect with Sith artifacts. Maul, who has chosen to forego the "Darth" part of his name, claims that to operate these devices one has to either be a Sith, or understand how they think. Many of us have predicted that Ezra would go over to the dark side in time, but perhaps the young Jedi just understands them better than most? Ahsoka has taught us that you don't have to belong to a certain order to be an effective Force-wielder. Sometimes people just float in the middle. Maul may be crazy, but even he has forsaken his tribe in order to forge his own kind of revenge upon those who betrayed him. His introduction was fantastic and very Yoda-like with his use of the cane and his "old man demeanor." Veteran voice actor Sam Witwer was superb as Maul, helping to give the old Sith a more menacing appearance than he already has. The former Sith has been given new life since his early demise at the hands of Obi-Wan Kenobi in Phantom Menace, and we are all grateful for it. Ezra's progression throughout the entirety of the episode was handled well, too. It's easy to understand his turmoil after meeting Maul who instantly tries to make him more powerful. The writers could have easily turned Ezra down a darker path, but decided to leave him in limbo. When given the chance to kill Seventh Sister, the eager Jedi chose to go against Maul's wishes and even when given another opportunity by the temple itself to obtain the ultimate weapon, Ezra chooses not to fall prey to the temptation. Ahsoka's words to Kanan ring true when she said he trained Ezra well. Speaking of Kanan, the man needs to learn to keep his guard up. It seemed like every time he turned a corner someone was about to ambush him. Unfortunately, one of those opponents was Maul and it may have cost him his sight. Whether or not he will remain blind is something we won't find out until season 3, but it was a shocking and well crafted scene. Chopper filled in nicely as a "seeing-eye-droid" of sorts for the now handicapped Jedi. Though blind, Kanan is still a formidable adversary and fought well against Maul before he made his escape. After that the episode gets pretty boring with nothing left to discuss... Wait! Except for that jaw-dropping shot of Vader riding in on his Advanced Tie-Fighter like a boss. Including the live-action films, that has to be one of the most iconic scenes we've ever seen in the Star Wars universe. After their short encounter, Ezra admits that he needs more training if he's ever going to defeat an opponent like Vader. Oh yeah, and there was also that small part where Ahsoka shows up to save the day. It's difficult to put into words just how amazing the duel between these former friends was. Ahsoka has truly developed into a talented Force-wielder and even injured Vader in the process. If you were a fan of the Clone Wars series, then you'll understand how deep their history goes. Hearing the dark lord call out "Ahsoka" in his half robotic, half regular voice was haunting. Ahsoka says she won't leave him behind again, but at this point in his tale, Vader is not ready to be saved. What a powerful ending to a great season of Rebels. Where our heroes and villains go from here is anyone's guess. Filoni and his crew provide us with a lovely closing montage, where we see Ahsoka venturing deeper into the temple and a weakened Vader coming out. The crew of the Ghost is reunited, but new battle scars are easily apparent, especially with Kanan. As Ezra sits alone in his cabin with the Sith Holocron, his eyes glow red and the device opens. Is this a sign of Ezra going dark, or is he merely in limbo? Maul too will be another wild card next season. The sinister looking Dathomirian Zabrak is loyal to no one other than himself. This reviewer is hoping for a Darth Maul vs. Vader match-up before the end of next season. There are so many possibilities that await us and as always, we'd love to read what you thought of this thrilling finale. May the Force be with you all as we await the season 3 premiere. Star Wars Rebels will continue with season 3 in the fall of 2016.